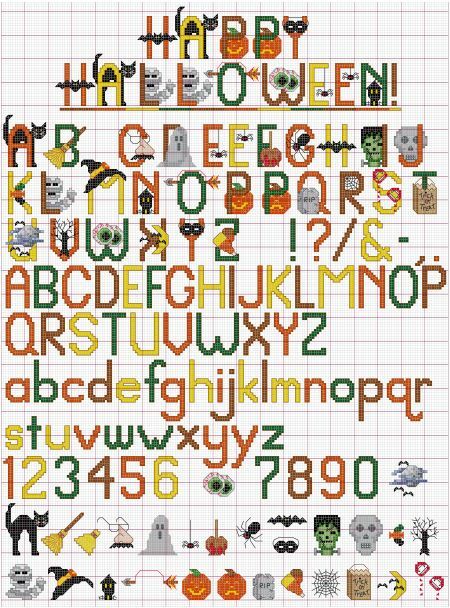 When designing this Happy Halloween Alphabet, I was reminded that Fall is approaching and nothing seems to ring in the season like Halloween. Tiny girls prance in their tutus and princess gowns. Little boys don their favorite superhero or monster costume. Home decorating ranges from a bowl of candy on a chair by the door to entire yards made into a cemeteries with "live" zombies that suddenly spring up to scare the wits out of anyone brave enough to venture near. We are, thankfully, ages from some of the more "colorful" roots of this tradition. In America, Halloween simply means (mostly) kids dressing up and trekking door-to-door for as long as the accompanying adult can last. Click here or on the picture above for an enlarged version of the Alphabet 32. 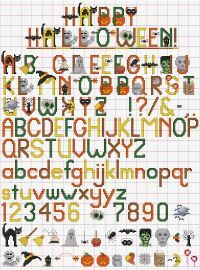 This Halloween Alphabet is packed with 27 different, mini, Halloween-specific graphic letters. Also included is a complete, picture-free alphabet set with both upper and lower case letters. Finally, you get a set of each complete image to make other image/letter combinations or to use the images apart from the letters. Click here for a printable PDF pattern of the Happy Halloween alphabet. Block letters with and without graphics, standard/straight. The upper case letters are 18 stitches high. The lower case letters without ascenders or descenders (ex: a, c, o) are 10 stitches high. The lower case letters with only ascenders (ex: b, d, h) or only descenders, (ex: g, p, y) are 18 stitches high. The lower case "j", with descender and a dot above, is 22 stitches high. The majority of numbers and upper case letters without images are 10 to 12 stitches wide. The majority of the lower case letters are 8 to 10 stitches wide. The width of the images and image-letter combinations varies. If you are unfamiliar with any of the stitches, follow the instructions and diagrams by clicking on the links above. Use the same colors reflected in the design, or substitute ones of your own. If using fabric with a different thread count, you may need to adjust the number of strands of floss you'll use. To help you decide, click the "Coverage" button on the left menu under Tutorials or click here. How to fit text into a design? 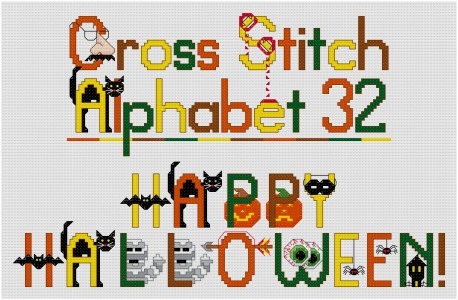 Learn how to select and adapt cross stitch alphabets by clicking on the "Alphabet 123s" button on the left menu or click here.